The beads rattling around in the bottom of their plastic cups were mostly the same color: white. Clearly, members of the class of 2016-17 quickly confirmed, their community, their workplaces and their neighborhoods — and even those they hire to handle their car repairs — generally look a lot like them. 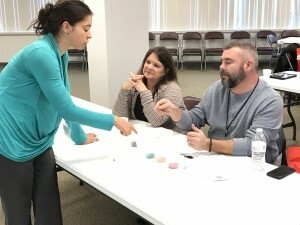 Class members Laurene Lonnemann (standing), Cindi Holloway and Aaron O’Connor participate in a diversity exercise. That tide of white beads wasn’t to illustrate any shortcomings. Rather, it sought an answer to a question at the center of a presentation to the class as part of its Leadership I Day on Wednesday, Feb. 1: How diverse is my personal universe? The seminar, presented by Lakshmi Vavilala, a diversity coach at Elanco Animal Health, sought to encourage the class members to tout inclusiveness in their organizations. The best-run organizations, she said, celebrate differences in their workforces. So do the most welcoming communities, which thrive when everyone feels valued, she said. But diversity sometimes is elusive. That’s where the beads came in. As part of an exercise, Vavilala asked the class a dozen questions about the ethnicity of their circle of friends, co-workers and others. They dropped a bead in their cups as they answered each question. A white bead stood for a white person, for example. A black one represented an African-American, a yellow one an Asian person, and so on. At the end of the exercise, there were very few beads of color in any of the cups. Lesson learned. Partnering with media: Executives from the Daily Reporter gave the class some tips on working with their community newspaper. From tips on advertising to pointers on how to submit a news release, the session was designed to introduce the emerging leaders to a valuable community resource. Crisis communications: Jen Schmits Thomas, a PR professional from Indianapolis, provided a blueprint for how to deal with public relations disasters. As they take on more responsibility in their organizations, Schmits pointed out, the future leaders one day will have to confront unpleasant news in their workplaces. How they react to it might be the difference between ugly public headlines and a sensible in-house resolution. In an age when every social media post has the potential to go viral, it’s important to react quickly and honestly, she told the group. Social media pointers: Andy Wilkins, digital sales manager at the Daily Reporter, walked the class through the basics of setting up and maintaining Facebook and Twitter accounts. Laws of Leadership: Gary Halliburton, a 2010 graduate of Leadership Hancock County, gave a lively talk on the “21 Irrefutable Laws of Leadership,” a book by leadership guru John C. Maxwell. The Feb. 1 class session was the sixth of seven class days for the class of 2016-17. It next meets on March 1. After that, the class members will work in earnest on their community projects with an eye toward presenting them at their graduation on May 3.